February 10, Kathmandu- Brazal Sahi of Greenland Secondary School bags First Prize in the 4th Edition of 'National Essay Competition' organized by National Secondary School, Balkumari, Lalitpur. The competition was held on the day of Saraswati Puja at the School. The program was organized with an aim to provide a platform for students’ presentation of their intellectual and creative capacity. 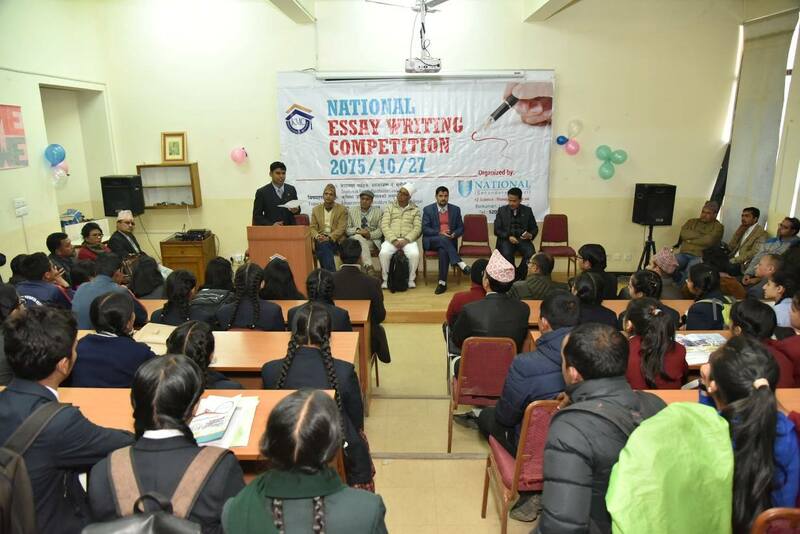 The essay competition was chaired by the principal of KMC, Mr.Surendra Subedi. The chief guest of the program and Chairperson of PABSON Mr. Bijaya Sambahamphe awarded the certificates to the winners. Brazal Sahi of Greenland Secondary School was awarded the first prize. Similarly, the second and third prize was awarded to Aabhusan Kafle of KMC School and Sadikshya Upadhya of Hindu Vidyapeeth while the consolation prize was shared among Ashish Giri of Geetanjali School, Omendra Shah of Radiant Readers Academy, Arim Magar and Dikshya Gautam of Angel Lord Academy and Krishal Maharjan of Little Angles' School. In addition to the certificates, the winners received a purse of Rs. 20,000, Rs. 12,000, and Rs. 8,000/- as First, Second and Third prize. 111 students of 43 schools participated in the program. Prof. Dr. Madhav Pokhrel shared his valuable insights to the students before the competition. The essays were judged by a panel of 15 juries including Prof.Dr. Ammaraj Joshi and Prof.Dr. Madhav Pokhrel. Main Jury Prof.Joshi also praised the efforts of National School to expose the hidden creative talents of the students.